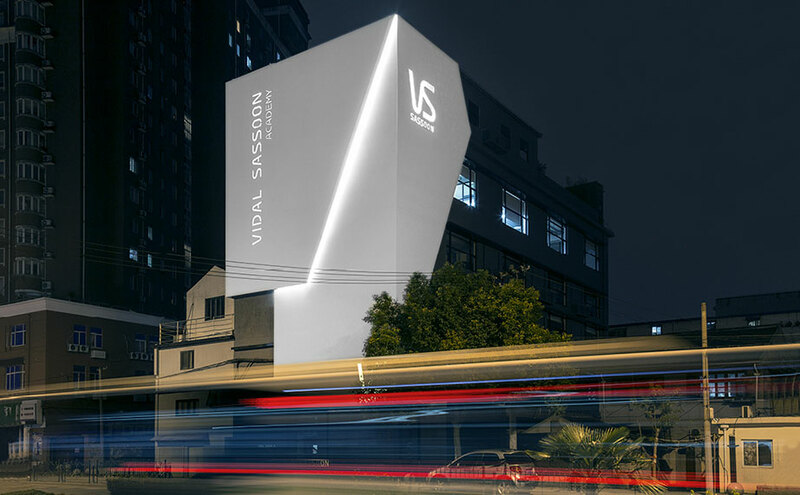 A project of the magnitude of the “VIDAL SASSOON ACADEMY”, in Shanghai, China, required an exhaustive search for an ideal location. After a year and 60 candidates, an emerging cultural and social area was chosen for this building, an ideal location for creating this creative space. It is not just a hairdressing academy, but also a social meeting point for creators, and ultimately a system which behaves differently from the sum of its parts. At this point, it was the KplusK associates which gave its avant-garde character to the design, each floor containing different stories and concepts, with a connecting point of design and culture within a style academy. PORCELANOSA Group is participating in this emblematic project with the compact mineral KRION® in its sloping ventilated facade. We find large sized pieces, made up of sheets whose imperceptible joins achieve a futuristic design of spectacular dimensions (a total of 290m2 of KRION® fv1100 Snow White). On its front we can find the name of Vidal Sassoon in a milled low relief which can be backlit from its interior, allowing the sunset to be viewed in all its splendour. This project is designed down to the last detail, and on the side of the facade we can find KRION® machined with the small initials VS, along with a large logo. It is a facade worthy of an academic cultural centre such as this.